Consumers say they want adventure. But do they? At a time when the White House is looking to build walls, restaurants across the country are opening up culinary borders. What began in the 1970s as a fusion-dining trend that first blended Asian and European traditions has gone into ethnic-mashup overdrive in recent years as chefs strive to stand out in a globally diverse and crowded industry. The recently opened Latin-American/Asian — or LatAsian —concept Dôa in Miami, for example, is expanding to Washington, D.C. and Boston. The “Italian-ish” Massoni in New York offers biriyani rice balls, and kale is spiked with green papaya and smoked saba-nuac mam. Diners in Brookyn, N.Y. have embraced the Matzo Ball Ramen at Shalom Japan. At the more casual end, a wave of mashup concepts are going beyond flavors and attempting to create new culinary formats that break down the traditional categories of burgers, pizza and sandwiches. Sushi burritos. 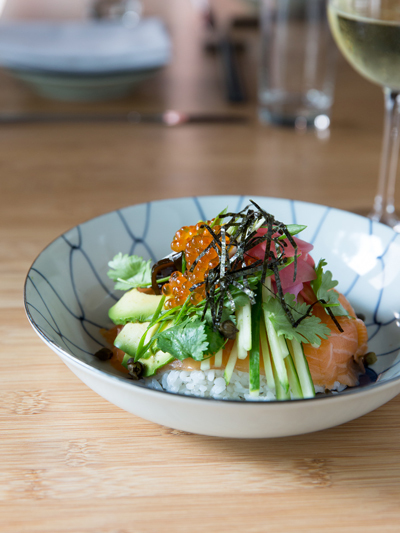 Grain bowls with a broad mix of global flavors. Build-your-own poke. If there’s a burger on the menu at new fast-casual concepts today, it’s wrapped in nori or glazed with gochujang. “People are looking for something a bit more creative and out of the box these days, especially the Millennials and younger people. 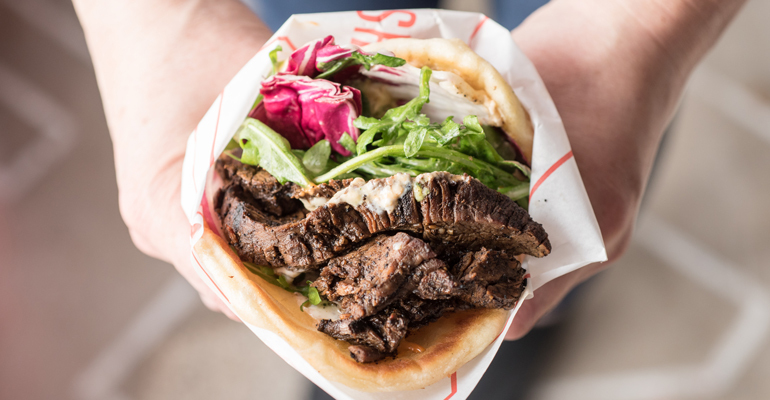 I think it’s super exciting,” said Jeanne Cheng, owner and founder of Kye’s in Los Angeles, which features Kyeritos, a hand-held version of a bowl that is sort of like a burrito but with eclectic flavors and a more healthful spin. But the operators of such culinary mashups say there are challenges. Consumers may be looking for adventure, but they also gravitate to the familiar, chefs say. Communicating a brand position can be difficult when seemingly diverse ethnic influences are at play. “It’s a paradox,” said Rohini Dey, owner of Vermilion in Chicago and New York, an Indian restaurant with Latin American influences. Still, operators like Dey, who first opened Vermilion in Chicago 14 years ago and later expanded with a second unit in New York, sees the American diner changing. 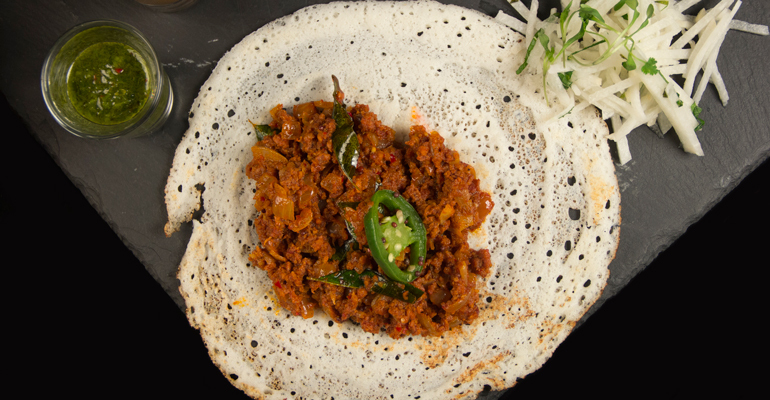 Of Indian heritage, Dey originally launched Vermilion with a menu that reflected the overlap of ingredients between India, Spain and Latin America resulting in part from the cross-pollination of Colonial times, with the Moors taking root in Spain, Portugal’s presence in India and Indian emigration to Central and South America. “If you walk into a Mexican marketplace, for example, you’ll see many of the same ingredients commonly used in India,” she said, including tamarind, lychee, cilantro, rice and mango. On her menu, dishes are designated as either Indian or Indian-Latin, the latter including things like the tandoori skirt steak, marinated in Indian spices, seared churrasco-style and served with raita and plantain crisps. It’s Indian enough to draw the Indophile but familiar enough to draw in those who might be intimidated, she said. Educating consumers about Indian food is still an uphill climb, she said. But Dey sees opportunity as consumers embrace certain food vehicles common across various cultures, like what Americans know as the burrito. 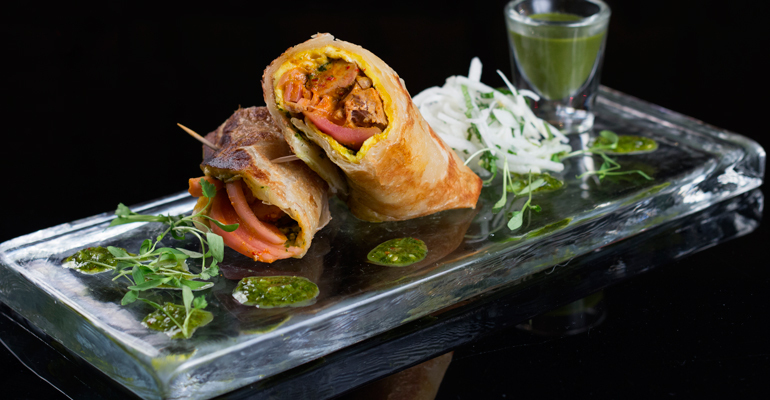 In March, Vermilion launched a new Dosa and Frankie Bar with a menu of the Indian street food favorites: dosa, like stuffed crepes, and frankies, which are kabab-stuffed parantha wraps and sometimes called Mumbai burritos. Guests can build their own by choosing the fillings and chutneys, from chorizo curry leaf and tandoori sour cream, to duck vindaloo with sundried tomato chimichurri. “If it’s successful, we might take it on the road,” she said. For some concepts, the idea is to introduce something new using something familiar. The burrito, for example, has become as American as, well, pizza. And a growing number of category-breaking new concepts in the fast-casual world involve vehicles that are like a burrito, but different. In San Diego, the founder of fast-casual pizza chain Project Pie has moved on to open Rolled Up last year, offering giant sushi rolls, designed to be eaten like a burrito. The Japanese Moooo includes sake-marinated short ribs, julienned carrots, roasted red peppers, jicama, corn salsa, seasoned cabbage, house-made “bitchin’ sauce,” blue corn chips and sriracha aioli, rolled into rice and wrapped with seaweed. 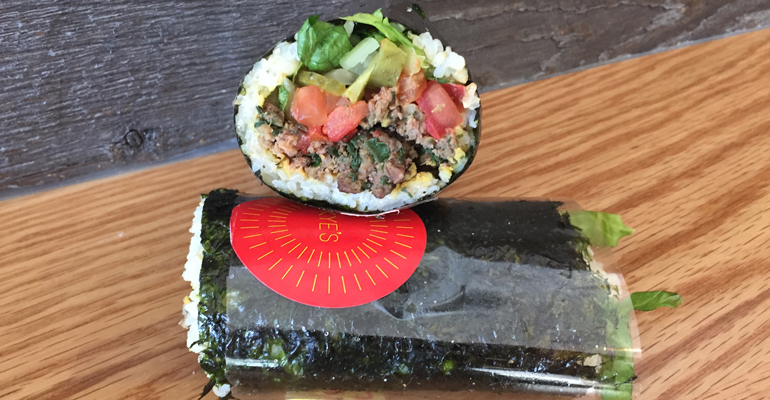 In Los Angeles, Nushii opened last year, taking the sushi burrito concept to a build-your-own format, allowing guests to walk the production line to choose their sushi-burrito fillings. Across town, highly regarded LA chef Josef Centeno is expanding his flatbread concept Bäco Mercat with the fast-casual variation dubbed BäcoShop, which opened in March. Flatbreads filled and folded like a taco are called Bäcos, and those wrapped like a burrito are called Bäcoritos. Fillings are a true global mélange, include grilled steak with coffee rub, mild red chile, almonds, hummus and charred-scallion crema; or chile shrimp with sriracha, buttermilk cabbage slaw and mint. Menu trends analyst Nancy Kruse, president of the Kruse Company, warned that authenticity is key with mashups. It’s a good way for nonethnic operations to broaden their appeal, introducing new flavors in a safe environment, she said. But category breakers might be better served sticking with menus that are truly ethnic, or comfort-food-with-a-twist. Cheng, the founder of Kye’s, took a decidedly different approach, veering away from any comparisons with sushi burritos. Kye’s launched in 2014 with what she calls a Kyerito, or a hand-held version of what might typically be found in a bowl. Kyeritos on the menu include the Nori Burger, with grass-fed beef mixed with chard, lettuce, tomato, onion, pickles, ketchup, mustard, nutritional yeast and a brown rice blend wrapped in a Korean-style nori. 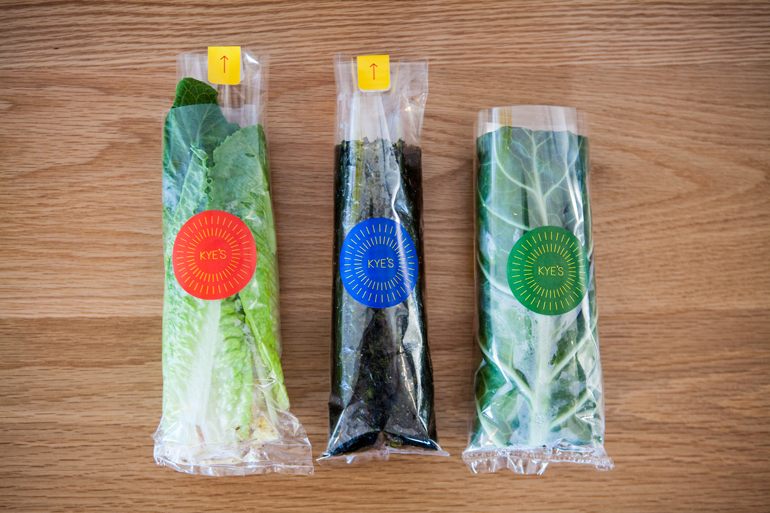 A Bulgogi Kyerito has thinly sliced marinated grass-fed beef with a six-vegetable mix, fresh herbs, kim chi, gochujang and a white rice-quinoa blend wrapped in romaine. A vegetarian bean taco with pinto beans, pico de gallo, a corn-jicama-cilantro mix, chipotle cream and blue-corn tortilla chips are wrapped in a collard green leaf. Cheng developed the concept, named for her son, in part to deal with her own family’s dietary sensitivities. The Kyerito takes some explanation, she noted. “But that’s why I tell people it’s a hand-held bowl, or a sandwich without the bread. As soon as you say that, people have a place to put it in their minds,” she said. Kye’s has been a hit, said Cheng. She is working on partnerships to scale the concept, but she admits to a nagging worry. “When I first started looking at doing Kye’s, I kept wondering why isn’t there a lot of innovation in fast casual? Why aren’t there different things? Why is it always the standard burger and pizza?” she said. The road for ethnic mashup concepts has been littered with bodies. In San Francisco, the Irish-Eritrean food truck EireTrea has shut down, though catering is still available. In New York, the Italy-meets-Japan concept All’onda closed last year. In Los Angeles, Seoul Waffle Pizza has disappeared. In Chicago, chef and restaurateur Bill Kim in December closed his Belly Shack concept when the lease ran out. 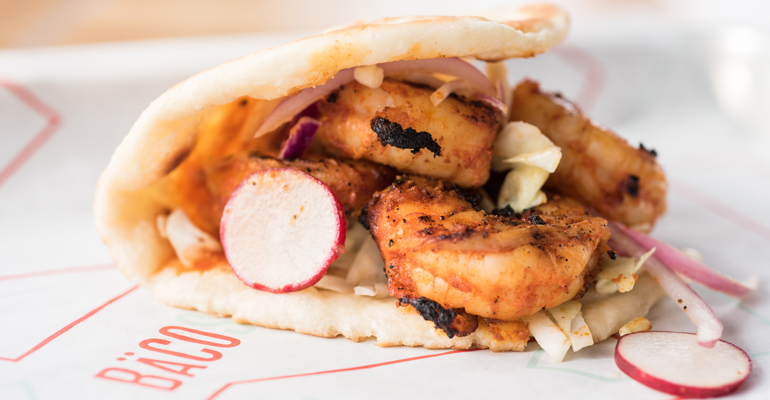 Known for its Korean/Puerto Rican menu, Belly Shack had a nearly eight-year run. Kim has moved some of the recipes and staff to his two other Urbanbelly restaurants in Chicago, which lean more pan-Asian. “People gravitated to what they knew,” he said. But Kim’s mix of Korean and Puerto Rican flavors comes from a place of authenticity. He was born in Korea and came to the U.S. at age 7. As a chef, he trained under David Bouley in New York, Susanna Foo in Philadelphia and Charlie Trotter in Chicago. Kim’s wife, however, is Puerto Rican and introduced him to that particular world of vinegar, oregano, garlic and plantains, he said. “In the beginning, at Belly Shack people thought we were just making it up and throwing ingredients against the wall,” he said. “But I have the license to cook what I cook. 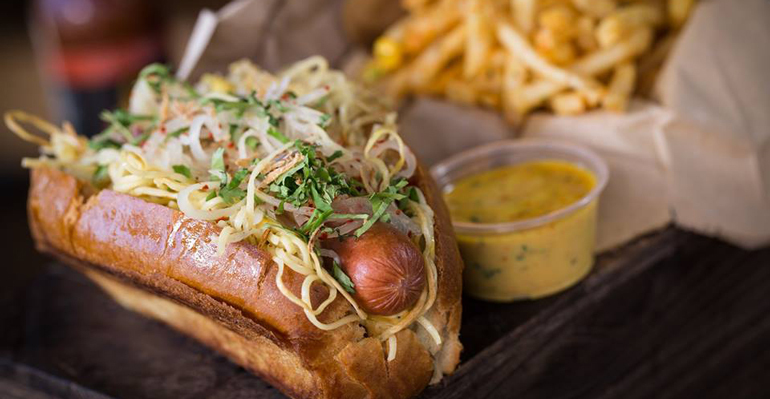 That love story lives on at Urbanbelly with dishes like the Belly Dog, a hot dog with curry mayonnaise, crispy egg noodles and pickled green papaya; or a plantain sandwich stuffed with Korean barbecue. Such dishes make perfect sense in an America that is rapidly moving toward more ethnically blended families, like his, he noted. Shalom Japan in Brooklyn, N.Y., has a similar story. The Jewish/Japanese concept is the result of a literal marriage of two culinary traditions. Chef Aaron Israel, who is Jewish, and his Japanese wife and chef Sawako Okochi opened Shalom Japan in 2013 with dishes like the Matzo Ball Ramen; and okonomiyaki, or Japanese pancakes, with pastrami, sauerkraut and bonito flakes. What Americans know as Jewish food is inherently fusion anyway, he argued. Meanwhile, Brooklyn diners don’t bat an eye at fluke crusted with kasha with a sake beurre blanc, or challah seasoned with sake kasu, the paste made from the byproduct of sake production, Israel said. But it has helped for guests to know the story behind the concept, he said.